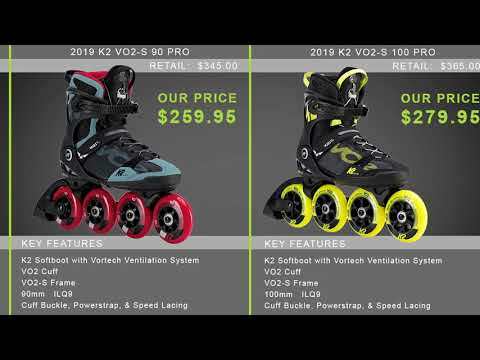 Part of K2's new VO2-S X-Training Series, the VO2-S 100 Boa Inline Skates are designed to give a killer workout perfect for athletes cross-training in the off-season. Featuring the unique one-sided VO2-S Frame, the VO2-S 100 Skate offers lightweight performance with precision and maneuverability not before seen on a skate. The skate's 100mm wheels offer a longer, stronger roll that is ideal for skaters who want to skate long distances. Combined with the smooth-rolling ILQ 9 Classic Plus Bearings, the VO2-S 100 Skate has a roll that rivals any skate on the market. The VO2-S 100 also come with K2's Vortech Ventilation System to keep your feet cool and comfortable, even during the most grueling of training days. The skate offers plenty of support thanks to the VO2 Cuff, and has a Boa Closure System for an easy-to-find, perfect fit with just the turn of a dial. 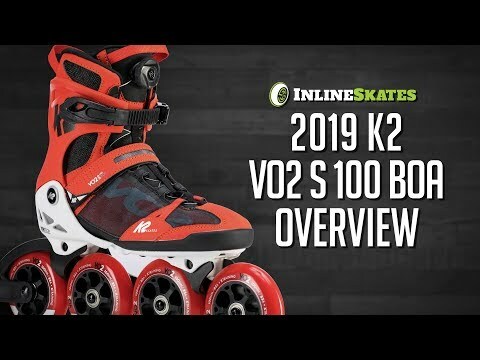 Take your training up a notch with the K2 VO2-S 100 Boa Inline Skates. Q: What is the difference in performance between a 3 wheel 110 skate and a 4 wheel 100 skate? A: It depends on what you want out of your skates, the 110 3 wheel is going to offer more control and maneuverability and the 4 100mm is going to offer more overall speed even with the slightly smaller wheels. I personally have a set of each and will use the 110 x 3 setup when skating in tighter situations and knowing I may need to corner quicker and will use the 4 x 100 setup on longer skates where I'm looking at more straightaways. They both have merit and if you're picking one over the other think of the type of skating you will be doing and your personal skating style. Q: Is there any difference in the new one sided frames performance wise? I could care less about looks just wondering how the one sided frames are different. A: The main bonus is going to be weight reduction in the skates, and ease of wheel and bearing removal. Q: So...no size 13 ever? A: We had a few size 13's available for pre-order but those have been purchased. If you're interested in special ordering a size 13 please contact customer service and they can look into ordering them for you. A: The frame is a metal alloy. Q: How much do the K2's VO2 100 Boa weight? A: We have yet to receive these skates so we cannot currently weigh them.